If you find yourself in Shanxi province, you can’t miss visiting Mount Wutai, located near the city of Xinzhou. Xinzhou (忻州, Xīnzhōu) is a medium-sized city located to the north of Shanxi Province, about 90 km from Taiyuan. Mount Wutai (literally “five plains” where 五 means “five” and 台 “flat”） is located to the east of the city of Xinzhou, in the county of Wutai, covering an area of 320 square kilometers. The name refers to the five peaks of the mountain that, instead of being a point, have a long flat shape and are generally without trees on its surface. Besides being a 5A attraction (the highest level rating for Chinese attractions), it is also one of the four sacred mountains for the Buddhist religion (together with Mount Emei in Sichuan, Jinhua in Anhui Province and Putuo in Zhejiang). In 2009 it was recognized by UNESCO as part of a cultural landscape heritage. The mountain is the seat of pilgrimage on the part of believers that come from not just all parts of China, but also other Buddhist countries. Getting to Xinzhou is rather simple, both by air or train but, sadly, getting to the mountain from the city is not comfortable. If you choose the first option, you’ll have to book a ticket for Wutaishan airport (五台山机场, wǔ tái shān jī chǎng). The airport has been recently inaugurated, and flights to this destination leave from only a few Chinese cities, so to find a ticket, you might have to change planes in other cities. The airport is about 40 kilometers from the center of Xinzhou. Xinzhou is served by slow train service. The railway station 忻州站 (xīnzhōu zhàn)is near the city center. A ticket from Taiyuan to Xinzhou in a hard chair goes from 5 to 15.5 Yuan, one to two hours maximum, while the same ticket from Beijing is about 70 Yuan, taking from 8 and a half hours to 11 hours and a half to reach the destination. You could, alternatively, decide to go to Xinzhou via the Wutaishan railway station (五台山站, wǔtáishān zhàn), which is farther from the Xinzhou city center a few hours by car), but closer to the main attraction: Mount Wutai (you will though have to take other transportation to get there, since the main entrance is about 60 kilometers away). A ticket from Taiyuan to Wutaishan station on a hard chair costs from 15 to 37 Yuan, taking 3 and a half hours to 5 and a half hours to reach the destination, while a ticket from Beijing to the same destination would cost around 50 Yuan, taking the train between 6 and 7 hours. Sadly, getting to Mount Wutai from both the two train station and the airport isn’t particularly convenient. They’re both pretty far from the entrance of the park. Deciding to leave the big cities not far from this destination, you can then take a tourist bus to the entrance to Mount Wutai. Leaving from Xinzhou, once you reach one of the two stations or the airport, you could also get to your destination by taxi (generally in unauthorized cars), but the price is rather high, or take a bus in the direction of Mount Wutai (certainly the cheapest option), parked outside. Traveling by car, if you have the chance, probably remains the most comfortable option. From the center of Taiyuan gas costs about 300 Yuan per car, to which you have to add the cost of the highway (usually free during national holidays). The trip takes about three full hours, depending on the traffic. Arriving at Mount Wutai, you’ll have various options to choose from. If you want to completely see the mountains in all its aspects, you’ll need at least two or three days. Stopping for just a day you’ll probably only have time for one of the following options. Xiantong Temple (显通寺, xiǎn tōng sì) is the oldest of those on the mountains, and one of the oldest in China in general, having been built between 58 and 76, during the Han Dynasty. Pusading Temple(菩萨顶, pú sa dǐng) dedicated to the Bodhisattva of the wise man Wenshu (really the entire sacred part of Wutaishan is devoted to this divinity), is particularly famous as a place of worship for Tibetan Buddhism. To reach it you have to climb a stairway of 108 steps. 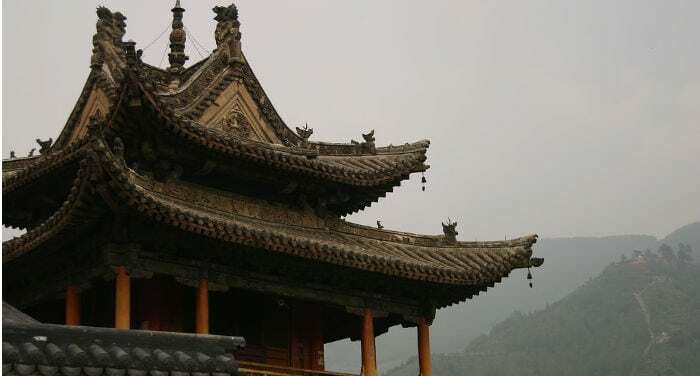 Tayuan Temple (塔院寺, tǎ yuàn sì) is famous for its pagoda (built during the Yuan Dynasty, in 1301) which, at a height of 54.37 meters, is the symbol of Mount Wutai. Longquan Temple (龙泉寺, lóng quán sì) is a characteristic marble building built during the Song Dynasty. Shuxiang Temple (殊像寺, shū xiàng sì) is particularly famous because inside of it there’s a statue of Wenshu that’s almost ten meters high. Some consider this temple the divinity’s home on Mount Wutai. Nanshan Temple (南山寺, nán shān sì) was built during the Yuan Dynasty, and deserves a visit for its white marble bas-reliefs of which, along with stone, it was built. Built in 1616 (Ming Dynasty), the Wuye Temple (万佛阁，, wàn fó gé) is also known by the name Wan Fo Ge, which literally means “pavilion of the ten thousand Buddhas” and is famous for the ten thousand decorative clay images on its interior wallso. Dailuoding Temple (黛螺顶, dài luó dǐng) is located on top of a hill, and to get there you have to climb a lot (abundantly!) of stairs. Once you get to the top you can not only enjoy the view, but also after paying 8 Yuan for an entrance ticket, the five statues of the Bodhisattva Wenshu. Puhua Temple(普化寺, pǔ huà sì) was originally a Taoist temple, and changed its name to Puhua in 1922. Its walls are almost 15 meters long and one of the main attractions of Mount Wutai. The western peak (西台, xī tái) reaches a height of 2,773 meters. This peak is particularly appreciated because from here you can have a wonderful view of the moon. On the peak you can also visit Falei Temple (法雷寺，fǎ léi sì), inside of which you can see the image of the Bodhisattva Wenshu. The central peak (中台, zhōng tái) reaches a height of 2,895 meters, and on it is built the Yanjiao Temple (演教寺，yǎn jiào sì) where, according to legend, the Bodhisattva Wenshuhad taught his writings to his students. Inside the temple you’ll see an image of the Bodhisattva himself. The southern peak (南台, nán tái) at a height of 2,489 meters, is not only famous for its Puji Temple (普济寺，pǔ jì sì) inside which you can admire the Bodhisattva Wenshu, but also the stone pagoda to the east of the temple, and for the characteristic flora that grows around it (in summer and autumn). The eastern peak (东台, dōng tái) reaches a height of 2,796 meters and preserves the Wanghai temple (望海寺，wàng hǎi sì) inside of which there’s the image of the Bodhisattva Wenshu. This is the best spot for watching the sun rise. The northern peak (北台, běi tái) is, at 3,061 meters, the highest of the peaks. The North peak houses the Lingying Temple(灵应寺, líng yìng sì) inside of which there’s a statue of the Bodhisattva. This is also the best place for enjoying the surrounding landscape. With a little luck and weather permitting, from here, more than the other peaks, you can admire an expanse of white fluffy clouds running beneath you. If you’re up for a long walk, you have two options: you can choose to climb the mountain by following the classic route, which brings you from the valley to the peaks (practically the road that the bus follows), or you can loose yourself in one of the less-explored areas of the mountain. In the non-touristy areas you can enjoy very beautiful landscapes that are more peaceful and rustic. Here, in fact live small families of farmers who cultivate the land in total peace and serenity. If you choose this route, I recommend that you ask advice from a local. In any case, remember to wear appropriate clothing (comfortable and warm, because especially in autumn and winter, temperatures can be rather low) and bring the necessary gear with you. If you like interactive theatrical shows, you shouldn’t miss the show “Meeting Mount Wutai again” (又见五台山, yòu jiàn wǔ tái shān). The show’s title refers to the fact that anyone who comes to Mount Wutai, praying that they might request a desire, and it comes true, will have to return to the mountain. The show’s actors are actually people who in a previous life came to Mount Wutai to request something, and now are returning a second time without knowing that they were already there. Before the beginning of the show, the spectator will follow a path surrounded by moving people and scenes before arriving at the theater. During the show the protagonists will move around not only the stage but also the public, involving them in the scene. It’s a work that is truly worth it, not just for the depth of the message and the subject covered, but also for its set design and other scenic effects. Even though the entire show is in Chinese, you can grasp the general sense by what takes place around the spectator, even if you don’t speak the language. The entire ticket for getting into the Wutaishan complex costs 145 Yuan. If you have a valid student card with you, you can use it for a discount. This ticket will give you access to the entire area where you can visit the various temples and go up to the five peaks. The inside of the Mount Wutai complex looks like a small town, where you’ll also find numerous shops, restaurants, supermarkets and hotels. Inside the park there are many temples that can be visited, some of which are free while others require an entrance ticket. Generally the tickets will cost 8 or 10 Yuan. If you decide to go to the peaks using the bus service, you can decide on buying a comprehensive ticket for all five peaks (350 Yuan), or just choose a few. Tickets for the east and south peaks cost 60 Yuan apiece per person, those for the west and central peak cost 80 Yuan each, while those for the north cost 70 Yuan. You can get a ticket directly from the ticket counter in front of the bus station that brings you to the peaks. To get to Dailuo Peak, at whose summit you can visit a temple, you can choose to walk, climbing a thousand stairs, or be lazier: the ticket for the chairlift costs 80 Yuan (round trip), or 50 Yuan just to go up. To go up or down on horseback, it you’ll be asked 50 Yuan a run, which is hard to negotiate. Just outside the park, a theater was built where interactive shows have been organized, bound to the history of Mount Wutai. A ticket for the whole show costs 199 Yuan. By buying a ticket at the little desk located just inside the ticket counter for Mount Wutai, you can get a discount (10 Yuan),and get a good spot by booking in advance. Ask for information directly at the desk. Here you can also hire a guide. Mount Wutai is a magical place in every season but, due to the cold of winter, the best time to visit is between April and October. In any event, you can arrange your visit on the basis of what you want to see. With the changing of the seasons, even the colors of the mountain change: in winter the peaks are covered in snow, and the ground is covered in a pure white veil. In Spring the tree branches become green and are covered in blossoms of pink flowers ready to bloom. In summer the meadows are tinted green, then giving way to the warmer colors of yellow and red during the autumn. The weather in Xinzhou is similar to that of Taiyuan, slightly colder, but on the mountain, the weather is much stiffer. Among the local products to try are the mushrooms gathered on Mount Wutai (台蘑),which have a genuine and wild taste that also seem to have high nutritional value and beneficial medicinal properties for the gastrointestinal tract. Staying on the subject of natural products, the golden lotus flower is also very famous（金莲花）, from which you can make a refreshing tea. Wonderful to taste, it is also a cure-all for inflammations. After infusing it in hot water, you’ll have a yellow colored drink. At times, besides just making tea, this flower is also used to prepare typical dishes. Even though they’re less famous than the classic brands, here in the area you can try a few different types of local beer, produced locally. Shops and stalls are spread everywhere. Here you can buy the typical products just mentioned, as well as incense sticks to light at the temples, and trinkets and other objects tied to religious tradition.